Kenton Cool is the finest alpine climber of this generation. His accomplishments are staggering. He has summited Everest eleven times. He is the first person in history to climb the three Everest peaks, the so-called Triple Crown, in one climb, a feat previously thought impossible. He was nominated for the prestigious piolet d'Or in 2004 for climbing a previously unclimbed route on Annapurna III. In 2012 he fulfilled the Olympic Games pledge of placing a 1924 gold medal on the Everest summit. He is the only Briton to have skied down two 8000-metre mountains, and in 2009 he guided Sir Ranulph Fiennes to the summit of Everest, helping to raise over �3 million for Marie Curie Cancer Care. 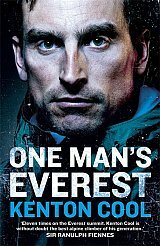 His accomplishments are all the more extraordinary considering an incident in the summer of 1996 which tore Kenton's world apart. Whilst climbing in Wales, he broke a handhold on a route aptly called 'Major Headstress' and fell to the ground with such force that he shattered both his heel bones. Initially told he would never walk unaided again, Kenton spent four weeks in hospital, had three operations, three and a half months in a wheelchair and months of rehab. Today he is still in pain and after a long day in the mountains it's not uncommon to see him struggling to walk or moving around on his hands and knees. Yet he still climbs. 'Why do you do it?' people ask him. This book tells why.